This Big Kinosoo Graphic is copied and modifited from the original on the cover of “Treasured Scales of the Kinosoo” a biographical/pictoral history of pioneer familes who settled in Cold Lake during the last century. The book was edited by Laura Dean Skarsen. Link to Next Post: The Rush is on. It was not until I moved from Victoria to Vancouver in 1965 to complete training at the Vancouver Police Academy, that I first realized the Big Kinosoo might not be the only large fish to ply the fresh water lakes and rivers of Canada. One day I happened to be reading an article in one of the Vancouver papers about a group of fisherman having caught a giant fish in the Fraser River somewhere near Chilliwack. 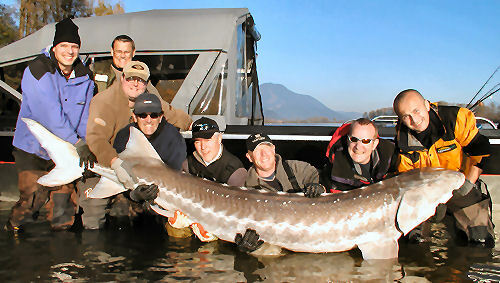 The fish, a White Sturgeon, weighed in at close to 1000 lbs (453 kgs) and took several hours to land. My thoughts raced back to Cold Lake and the big Kinosoo. I also recalled there was a river north of Edmonton, the Sturgeon River, and wondered if it might contain or might have once contained similar giants. I did no further research at that time as my life was headed in other directions and it was not until long after I retired that my thoughts again returned to the Big Kinosoo. The web provided a wonderful search tool and, sure enough, I was able to come up with number of photos of giant fish that can be found right here in Canada. While there will always be skeptics who doubt the existence of Big Kinosoo, frequent reports of sightings and of confrontations with that big fish beg the question of what lurks in the depths of Cold Lake. I doubt these stories are just the product of overactive imaginations of a few fishermen who may have stayed a little to late in one of the Cold Lake beer parlours. Many of the large freshwater fish of which I found pictures on the web are certainly capable of swallowing a man whole or taking down a good sized boat as did the great white in “Jaws”. It is not a inconceivable that a giant fish in Cold Lake could be capable of stripping a net from its anchor or pulling a downrigger from a sport fishing boat. 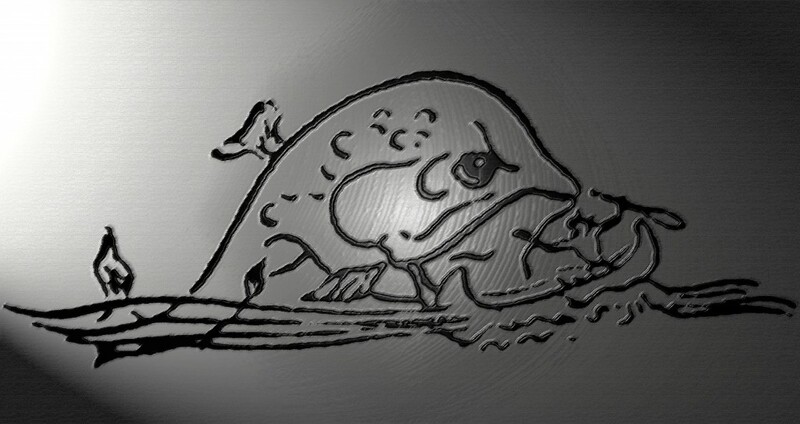 Does the fish in the following photo not look strikingly like artistic drawings of the Big Kinosoo? 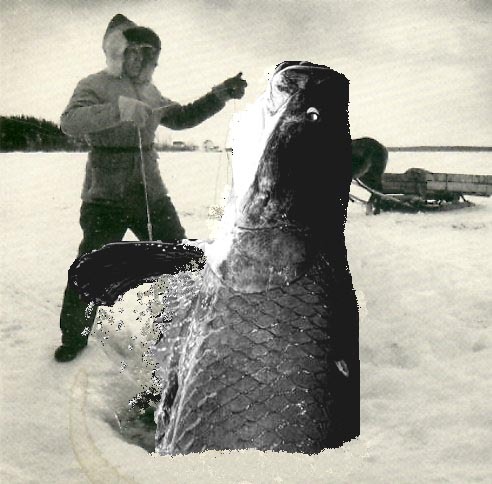 Photo (unknown source) c1930s: This startled Cold Lake commercial fisherman got more than he bargained for when a Kinosoo type fish swallowed the large rock he used to pull down his gill net. Suddenly the giant fish surged up through the ice hole then slid back down. It is clear the fish could certainly have swallowed the man or, for that matter, his horse. It is a matter of fact that these giant fish exist and there is not one good reason to discount anecdotal evidence that at least one or more of these giants, perhaps not yet classified, lives in the depths of Cold Lake, one of the deepest lakes in Canada. Take a few minutes to view the pictures and to read the background stories on the web. If you are a skeptic you might find that after reading you will be a little less inclined to dismiss the Big Kinosoo as a “myth” or “legend”. 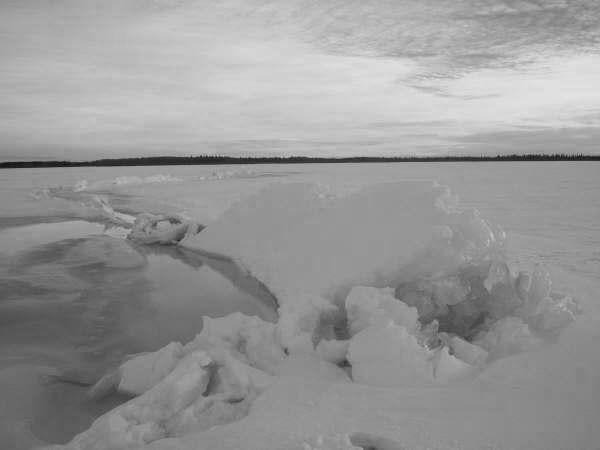 You might even be inclined exercise a bit more caution when navigating the waters of Cold Lake particularly around French Bay. This man battles a giant fresh water fish known as the apiama or paiche. That such fish exist in the world today lends at least some credence to the story that just such a fish may have lived, and still lives in the depths of Cold Lake. 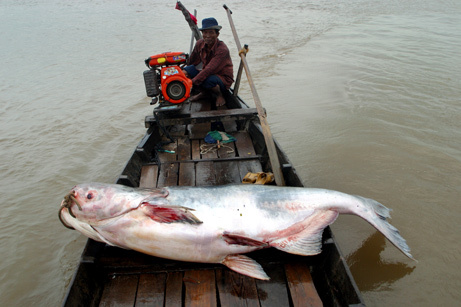 660 lb (300 kg) Catfish taken in a fresh water river. Photos above and below: Some believe heaves and open stretches of water such as that depicted above and below, result from warming and cooling spells during which the ice expands and contracts. 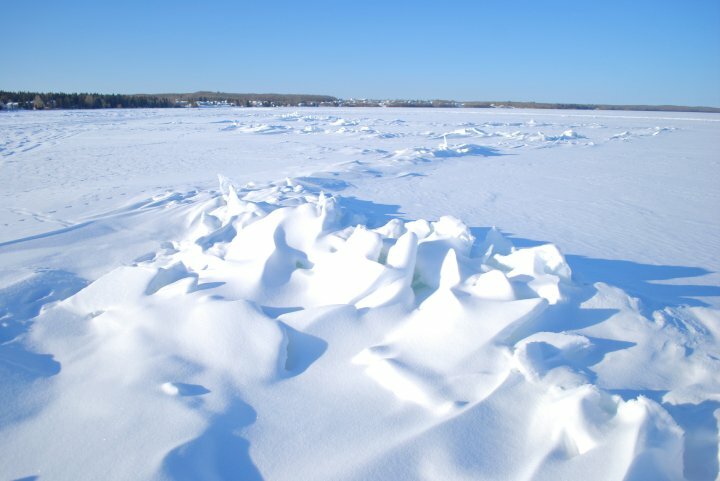 Others, who have lived for many years in Cold Lake, suggest the more likely cause is a very large fish surging up from the depths and hitting the ice, then running an irregular pattern across the lake. The sound made when these large fish strike against the ice, sound similar to thunder. Photos courtesy of Kaleb Casper.